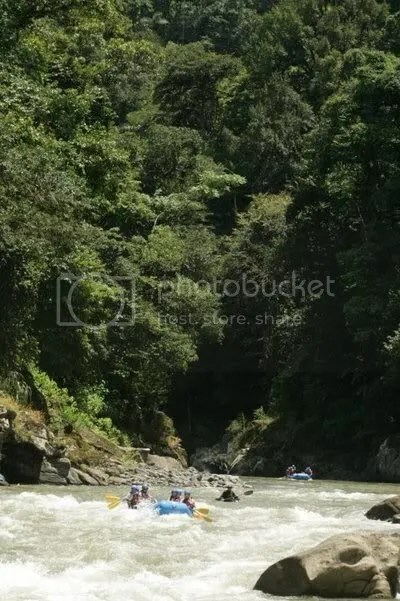 If you’re going to go white water rafting for the first time ever, why not go down The Pacuare River in Costa Rica (a river named one of the best in the world for this sport by National Geographic)? I mean really, if you’re gonna do it, go all out. We did. TAT Editor, Ben Britz, and I jumped on an AA flight from NYC to San Jose and hitched on to Swiss Travel while recently visiting Costa Rica. I know, I know. A travel company doesn’t exactly seem like the most anti-touristy way to see a country–but these guys beat the odds and actually do a hell of a lot more help than they do harm. Grossly over-informed guides, Andres and Jorge, can give you a class or two in an array of subjects while speaking perfect English and handing you an ice cold Imperial simultaneously. That’s what I call an education. They drove us all the winding way from San Jose to the eastern side of Costa Rica. I got carsick. I played tough and denied it. We met up with rafting guides from Exploradores at a section of the river that was shadowed by a towering hill, from which a dirt road paved the path to the riverbed. 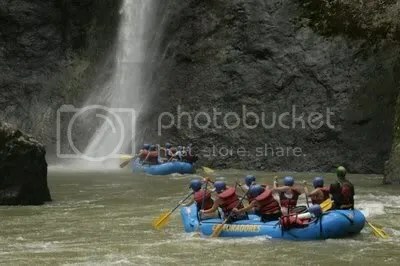 Having been aptly instructed on the necessary skills for white water rafting (I realized half way through the overview of the rules that I hadn’t been listening and kind of freaked out trying to mentally catch up, certain I’d pay for my mistake with a busted skull within the hour), we piled into the bright blue boat. Down the river we went. While we didn’t plummet down the Niagara, we did tuck some Class 4 and 5 rapids under our belts from this trip. “Down!” our guide would shout during the scariest moments. He screamed excitedly like this in between making fun of us each for being clueless Gringos with poor hand-eye coordination. He did this during calm waters and he did this with a friendly smile and for whatever masochistic reason, I liked it. We pulled over for a lunch and watched the Costa Rican guides dice up watermelon and pineapple for us. We kicked back on the dirt beside the river and got to know the guides. One of them threw me in the river by surprise. We leeched onto Swiss Travel for some other Costa Rican adventures, all of which were successful and will likely be documented. 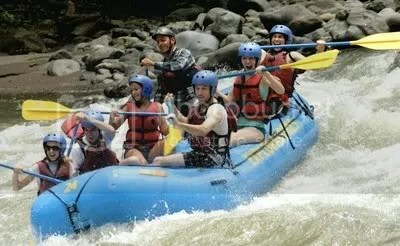 But the white water rafting was our favorite date with Swiss. With all of the constant splashing, our sun-block abandoned us during the ride and the result was a very red and hurt version of us both. I wore a floor-length gown to dinner that night in an effort to spare the public at large the sore sight of my torched skin. I sipped my Cabernet that evening and gazed onto the San Jose night light—glowing like a fire out of control. I was scorched badly enough that no amount of wine would remedy my burn, but I was smiling ear to ear, even in those several hours later, about what a blast I’d had that day.